I have been trying to shape a Boule for many times, but it come out quite flat. I have tried to left it on the counter, in mixing bowl, in dining bowl and so forth, but neither of them will have to maintain its shape. I did the second proof without rice flour, replaced it with a bowl lined with greased parchment paper. When I remove the dough it started to spread out. It gives me a far a bit of oven spring but still it not like a soccer ball shape. Photos will be uploaded later tonight, as its still cooling down. Whatever recipe/formula you are using, your dough sounds slack. Possibly high hydration? Take extra care in shaping, and do not overproof. Also what works for me is to place the shaped loaf in a cast iron or enameled dutch oven, and let the final rise take place there, then baking it in the vessel. Alternately, just place your shaped bread in a bread pan. if you are going for a specific shape, you may have to adjust your recipe/formula & ingredients to achieve that shape. For example, if you are trying to get a tight, tall round and using an 85% hydrated dough, good luck, because you will likely never get the shape you desire from that kind of dough formula. Different flours can help with this as well; each flour hydrates in different ways. Mix by hand in the evening, rest a few minutes, fold in the bowl a few times. Leave overnight at 60-70F, fold whatever it needs in the morning, shape, proof and bake. Simple bread. 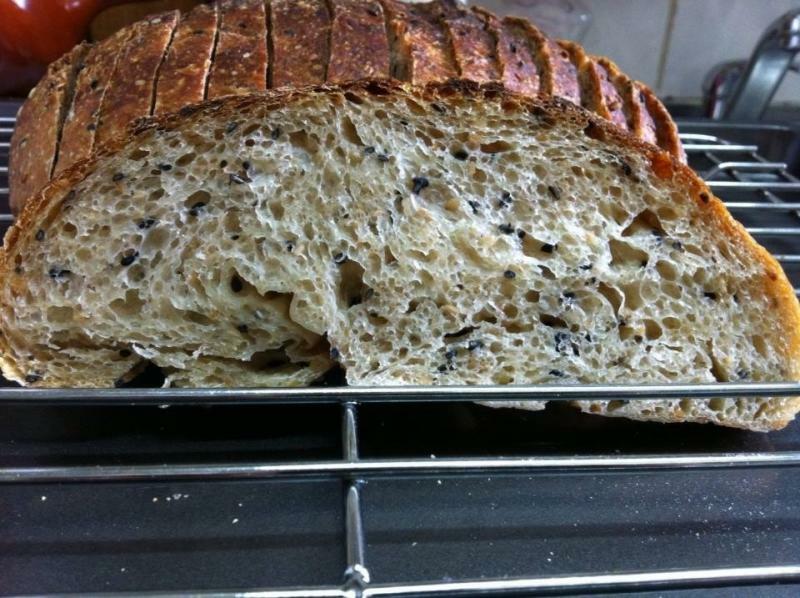 BY SUSAN from this forum"
Since my starter is 100% wet starter oppose to her 65% firm starter, I followed her recipe to words, this would give me a dough at 71% hydration, which is sticky but not slack. I have created a surface tension using the unfloured surface, but one accident happened when I tried to load my dough onto the stone. I dropped it and part of it sticked to my baking stone and another part is on parchment paper; therefore its squashed. Sigh! I dun have any cast Iron pan or the very expensive casserole dish from France either, can I put it in a 8" cake pan instead? Ive seen some of the members here made a perfect baguette at 85% hydration Ive tried to imitate their formula and shaping without any success. a favor. Put some parchment paper on the bottom and do the last rise in the springform and bake your bread in it at a temp of around 450 for the first 15 minutes with steam and 425 until done (Thermometer reads 200). For steam I use two of those tiny aluminum loaf pans filled halfway with hot water and put on the bottom of the electric stove by the elements. The water starts boiling during preheat and the steam seems quite adequate for the bread to rise nicely. If I use springform, do I still need to put it on a baking stone? I have a huge tile in my oven all the time, you know one of those cheapies from Lowes, but you wouldn't really need one. Take a look at your dough when you have done kneading or folding. With this kind of flour it should be easy to see if you have a "windowpane". The overnight rest should allow great hydration of the flour but the gluten and starch may need a little more development. Isn't this dough closer to 80%? A few percentage points makes a difference at this hydration in the handling and dough characteristics. You don't need an expensive French pan just for baking bread. Take a look in your cupboard and you may find something that works very well. My favorite vessel is a rectangular casserole dish. Another is a rectangular angel cake pan. I have been know to use corrugated aluminum garden edging (new, of course), foil, any iron frying pan or any pot that is oven usable. on the second day I check fold a few more times and did the window pane test it was stretchy and passed the test. there was another 25g of Ka www which I suppose is wholewheat flour. 217.5/307.5. Just shy of 71% which is hydrated but not overly so. Your last picture doesn't look so bad. How long are you doing your final proof? Spreading excessively with no spring makes me consider two things. First already mentioned gluten. Second overproofing. But a final consern us the minimal pre fermented flour. Only 2.5 %. In that case your last pic is a triumph. I think you lack yeast. When I shape it i degas it as little as possible. I have left 2.5 hours for the final proof. When I did the poke test, it come back up fairly quickly with a little indent. should it be considered as overproof? this loaf is still a bit sour to taste, would that have something to do with the long fermentation? what can I do to make it less sour? If I adjusted it to 20% preferment flour, my guess is that could cut the bulk fermentation time in half, which is about 4 hours for it to ferment in 27-28 degree environment. ifIf if there isn't enough yeast to start with the poke test serves no purpose. 8 hour bulk ferment is long and would too long for most dough. Well at room temp that is. The taste I think you don't like us probably the small amount of yeast over fermenting. Yes 4 hour bulk would be a good guideline. But it's the dough that tells you. To avoid sour keep your dough temp between 73-75 opposed to 77/78. Also avoid cold retarding the dough. But I think you might like sour. I think you dislike the over fermented flavors. i look forward to your future results. I think I would have problem maintain the dough temp between 73 - 75, as HK is very very warm at the moment (around 30C for most of the time) Would the heat bring out the sourness? If I add a pinch of yeast to reduce the fermenting speed would it overcome the heat in HK? I guess I can try your suggestion this weekend and show you the result. Specific temperatures affect speed and flavor development. There's a few different zones that intensify the sourness. I'd say before figuring that out try the one simple change if the dough and room are very warm decrease bulk time. I with a plain sour I usually get to the shape just shy of the dough dough doubling in volume. When I used sourdough starter to make grissini last night, it doesnt have the sourtaste and smell. Im thinking maybe the starter i used had been overly mature. Coz I didnt do a 1:2:2 feed before my bake, I took my starter which i fed once a week @ 1:10:10 out of the fridge 2 hours before my bake. But the starter I used last night has just reached its prime. Im not sure if that makes a different. So in order to have control and predictability you need to maintain your starter. If you type in sourdough maintenance in the search box there should be oodles of info for you to read and follow. Many here feed there starter once a week and do quite well. What most of those people do when they plan to make bread are a few builds in advance to make it strong enough to levain the dough. 1:10:10 by weight is quite a small innoculation and would take some time to mature. I'd suggest building your starter with a few feedings before proceeding to making your next dough. I use different ratios depending what flours I use and flavor I desire in the starter. The lower the ratio of starter to flour the longer it takes to peak and more flavor will develop. The more whole grain in your levain the faster it will act and it too can add some serous flavor. If you'd like it to be more sweet and buttery you could feed it equal portions and more often. So many ways to do this. I'd suggest 1:2:2 let it peak (doubled in volume) and then repeat (this can take anywhere from 4 hours to 24 hours pending the state of your starter) so keep an eye on it. Once you've fed the starter 2 or 3 times you should be ready to go into dough making. Whenever you make your starter don't forget to keep a seed to feed and keep stock in the fridge for future bakes. So all in all when you want to bake you need to think a few days in advance and get your starter up to snuff. Hope this helps. As mentioned there is a ton of info on this here to help you out. Mini Oven is very smart with starter maintenance and getting it healthy. The reason I use such a small innoculation is becoz I only bake once a week and I want it to mature right before I started baking. But if it could be the reason that brings the sourness. As for the heat problem can i leave the 1:2:2 fed in the fridge after it increase its volume by 20% and let it do the rest in the fridge? Then followed by a 1:1:1 feed in the morning. Or Is it possible to just fed it once and get it into my bake? Yes you can do that. over the course of the week that starter is getting very sour. The yeast activity is dormant and even dying. Don't get me wrong it's a fine way to keep it but the reason you need to build a few times before making dough. Yes you can do a 1:2:2 let rise a bit then retard. Pull it back out and feed a second build. since its cold using warmer water will keep you from having to wait for it to start being active. to determine ur timing you could make a tiny levain just to see how long it takes to double. Generally If I'm going to retard my levain it's 2-4 hours after feeding pending its temp and room temp. Im excited to see your loaf. You crack my super sour sourdough mystery for me!!!! Coz when I saw it rising so quickly I thought "gee it must be very active, even it smells a bit sour." Then every time I ended up with a dense and super sour loaf. I shall start to refresh my starter tomo to prepare for the bake this weekend. Thank you very very much!! Your help is enormous!!! yourTo your blog shows some nice bakes. Once uy get the hang of your starter it's just longer timing than yeasted doughs but shape score bake u already know. I've recently found that increasing the number of "stretch-and-fold" steps seems to enhance oven spring, perhaps because it incorporates some largish bubbles of air in the loaf. After I shape my loaves I flour them thoroughly and let them proof in a linen couche till they have a "skin" that has not ruptured due to overproofing. 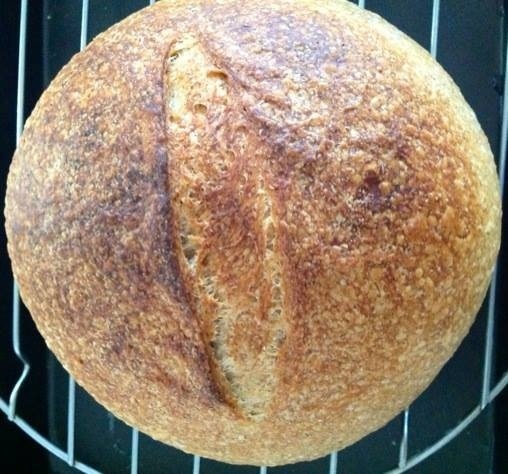 On a boule, one slash, or two parallel slashes may be better for oven spring than intersecting slashes as it allows the "skin" to help keep the loaf from spreading sidewise in the oven. I bake with steam in the oven from a pan of hot water. All these things seem to enhance oven spring, for whatever reason. your advise is added to my to do list for the coming weekend! i hope to bake a decent sourdough, otherwise my sleepless night might continue. has eve bake another loaf this morning, this time I omit the sesame and oil change it to a plain sourdough norwich bread using ww starter. 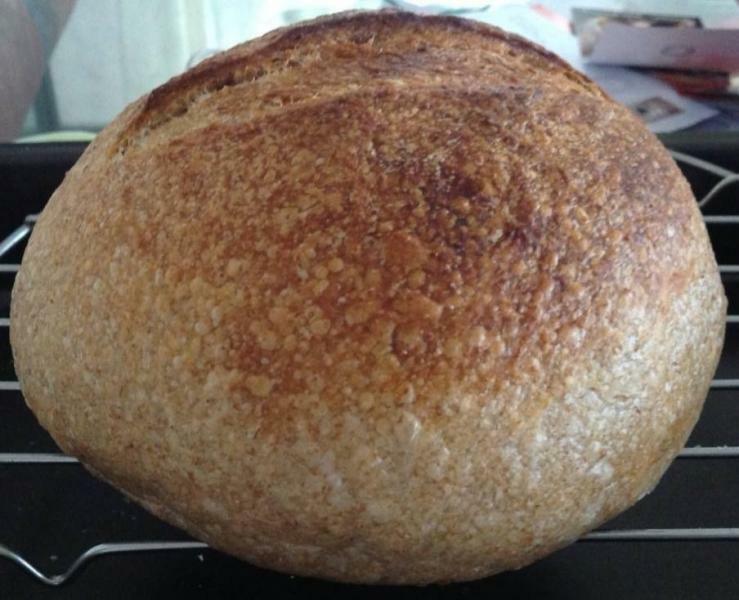 having incorporate all the advice, I pull together this boule which has a far better appearance. I'm still waiting for it to cool down, to have a taste. hopefully this won't be too sour like the previous one.